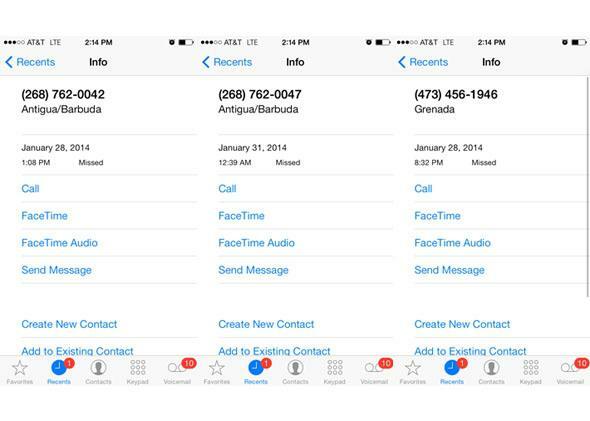 Missed call from Antigua, Jamaica, Grenada: The one-ring scam gets money by tricking people into calling internationally. Missed a Call From Antigua or Jamaica? Do Not Call Back. If you get missed calls like these, just ignore them. If you get an unexpected missed call from a Caribbean number, don’t call back. It could be a hoax. An oldie but goodie called the “one-ring scam” is gaining momentum again and leaving people with fraudulent charges. As independent analyst Richi Jennings points out, the scam takes advantage of a part of the North American Numbering Plan that gives three-digit area codes to certain Caribbean countries. People can connect to these numbers from U.S. phones that don’t have international calling plans even though they are actually “premium rate” numbers. In the one-ring scam, a robocaller only lets a call ring once before hanging up to maximize the chance of creating a missed call without a person picking up. If someone does pick up, the robocaller disconnects, and there is less of a chance that person will be drawn into the scam and call back. The Better Business Bureau lists calls from Antigua and Barbuda (268), the Dominican Republic (809), Jamaica (876), the British Virgin Islands (284), and Grenada (473) as potential scam threats. People who do call back could be charged something like $30 for the international call, depending on the carrier, and see fraudulent service fees showing up on their phone bills. This process of “cramming,” when third-party scammers sneak bogus charges onto legitimate phone bills, is ever on the rise, according to the Federal Trade Commission and Federal Communications Commission. Between text message scams and Web hacking it can feel like nothing is safe, but this trick, though annoying, is fairly easy to avoid. The first step to protecting yourself is just ignoring the calls, but if you’ve called one of the numbers back by mistake, alert your carrier and watch your phone bill to make sure unusual charges aren’t cropping up.